Bromley Sports is investing in "the best of the best" to bring more of its manufacturing in-house at its facility on the Advanced Manufacturing Park (AMP) in Rotherham. 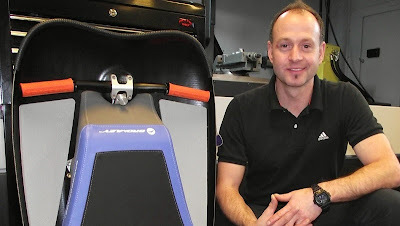 Kristan Bromley, Britain's number one skeleton racer for the last 20 years, co-founded the business with his brother, Richard as an indirect spin out from a BAE Systems sports technology initiative. Bromley Sports specialises in athlete-focused engineering technology and currently supplies 22 nations preparing for the next Winter Olympics, including Britain, Norway, Russia, Switzerland and Korea. The firm ships between 100 and 200 bespoke sleds to athletes around the world, but is currently moving into the recreational arena, having designed and developed a patented sled for an exciting new snow activity, Baseboarding. The new adrenaline sport, which is best described as bodyboarding on snow [or headfirst sledging], where participants slide down a groomed run on a specifically designed board. The low profile design keeps the rider close to the snow with a low centre-of-gravity and the Baseboard brings together all of the technology that has helped Bromley's customers win so many medals - 3D design, polymer composite materials and aircraft grade alloys. With more than 60 carbon fibre and stainless steel components in the skeleton sled, and the prospect of mass producing Baseboards, Bromley says it was important to bring the whole operation in-house. To achieve that, they invested in a Doosan DNM 650 VMC, retro-fitted with a Nikken fourth axis rotary table, driven using VISI's CAM software with multi-axis machining capability, meaning they can develop complex tooling as well as machining prismatic style components. Dr Kristan Bromley, CEO of Bromley Sports, said: "Previously, we'd sub-contracted most of the machining work but we realised that we were missing a trick so to speak with innovation, and not maximising the development process. "By bringing tooling, design and manufacture in-house we can develop products faster, we can innovate more efficiently, we can create new designs and develop new iterations of those design faster and more efficiently. It's really given us another string to our bow as a business in getting our products out there for our customers to buy." The equipment sets Bromley up should its Baseboard concept take off as expected. It is currently available to ride at the Whistler Olympic Park in Canada. Kristan added: "We are changing very quickly as we move into the Baseboard domain and the recreational sled domain. We are looking at five to ten thousand of parts in the next two to three years. We are very much going from a highly customisable product at low volumes to more of a mass market. "Our mission is to become the most advanced sliding sport product manufacturer in the world."